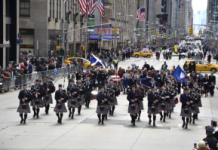 The National Tartan Day New York Committee today announces Barbour Inc., the North American subsidiary of J. Barbour & Sons, Ltd., of Great Britain, as the new Platinum Sponsor of the 18th Annual New York Tartan Day Parade which takes place on Saturday, April 9, 2016. 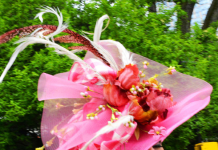 As Platinum Sponsor, Barbour is named the exclusive outfitter of contemporary clothing, accessories, and dog accessories. Barbour was founded in 1894 by John Barbour, a Scotsman from Galloway in the Borders of Scotland. John Barbour came to South Shields in the North East of England to set up the first Barbour store, but the company has never forgotten its Scottish roots and celebrates them through its renowned and exclusive tartans. Based on the Ayrshire District Tartan, the Barbour tartans today are used in jacket linings, knitwear, shirts, polos, accessories and dog coats, making Barbour products instantly recognizable. The colors in the tartans reflect the color images of the iconic Barbour waxed jackets with the main base colors of navy, olive and sandstone alongside gold/white/red overcheck lines – colors which are timeless and versatile. 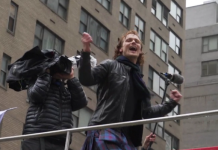 “The Tartan Day Parade gives Barbour a great opportunity to creatively showcase its association with tartan, and we look forward to taking part as the new Platinum Sponsor for 2016 while still supporting the Scottie and Westie dogs,” said Tom Hooven, General Manager, Barbour Inc. Prior to the parade, Barbour will judge the Tartan Dog pack, made up of Scottish and West Highland Terrier dogs, in five categories including “Best Westie Male,” “Best Westie Female,” “Best Scottie Male,” “Best Scottie Female,” and “Best Overall,” and award prizes to both dogs and their owners. 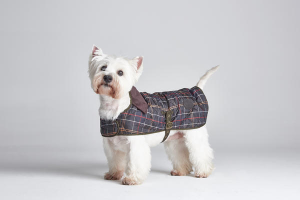 Barbour will also provide 25 quilted tartan dog coats for the group as they strut up Sixth Avenue with their owners. Helen Barbour, Vice Chairman of J. Barbour & Sons, Ltd. and fifth-generation Barbour family member, will travel from the UK headquarters to celebrate the brand’s tartan heritage by participating in the parade activities and dog judging. For the Autumn/Winter 2015 collection, Helen introduced a range of dog accessories including dog beds, collars and leads. Throughout the years, Barbour has remained true to its heritage while developing relevant, fashionable pieces. Barbour Inc. aspires to continue to share its renowned craftsmanship and authenticity. For more information about Barbour, visit www.barbour.com/us. Established in 1894, J. Barbour & Sons is a British company headquartered in South Shields, England. They produce a complete line of lifestyle clothing inspired by the British Countryside most notably waxed cotton and quilted jackets, and a full range of contemporary and classic knitwear, shirts, trousers, headwear and accessories. The Heritage collection draws inspiration from Barbour’s rich archives taking key features from iconic pieces and styling them with a twist to create garments for today. A family-held business, Barbour employs more than 800 people worldwide and owns and operates one factory in South Shields, England. Consumers are invited to call Barbour, Inc., the U.S. subsidiary in Milford, N.H., at (800) 338-3474, for a catalog or a name of a local retailer, or visit the Barbour website at www.barbour.com/us. 1. J Barbour & Sons Ltd was founded in 1894 and has always been based in South Shields in the North East of England. 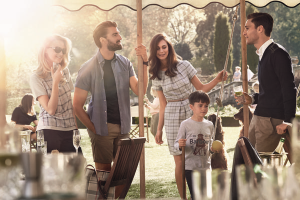 Barbour is a 5th generation, family-owned business. 2. Barbour is a leading lifestyle brand manufacturing and retailing waxed jackets, waterproof breathable jackets, wools, quilts, shirts, knitwear, trousers, footwear and accessories in over 40 countries worldwide. 3. Barbour’s customer service is unique – waxed jackets can be returned at any time for rewaxing, repairs or alteration. Next articleBarbour Celebrates Special Contest for Scotties and Westies!